Born in 1972 and raised in the suburbs of Chicago, Diana’s father was an avid fisherman and introduced his sons and daughter to fishing. At the age of sixteen, Rudolph’s father introduced her to fly fishing, and by the time she was an undergraduate had stepped into the world of saltwater fly fishing. Diana studied biology in college and contemplated graduate school, but while working part-time at Trout & Grouse fly shop in Chicago she realized her love for angling would direct her career. 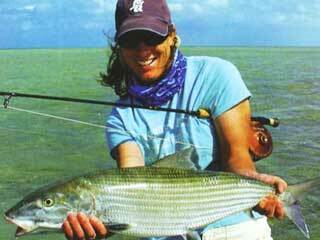 Over the next ten years Diana dominated the women’s bonefish and tarpon fly-fishing tournaments in the Florida Keys. She virtually rewrote the Women’s IGFA World record book on bonefish, permit and tarpon as well. During this time Diana also worked at Florida Keys Outfitters. In 2004, Rudolph was the first woman to win the 30th Don Hawley Invitational Tarpon Tournament against an all-male field in the Florida Keys. Diana has fished extensively in Australia, the Bahamas, and Belize. She is on the advisory staff for Sage rods and RIO Products, a member of the Board of Directors for the Federation of Fly Fishers and splits her time between the flats of the Keys and the rivers and streams of Montana.